You should see my office right now. Well, scratch that. Even if you could be there, you wouldn’t actually be able to see it because of the piles and piles of cookbooks threatening to wall me out. One of the perks of being a food blogger — besides the obvious prestige that comes from telling people I am a, ahem, food blogger — is that most of the major publishers send cookbooks right to my door. I get so much inspiration from these daily deliveries, and, in case you haven’t noticed, they play a crucial role in keeping this blog relevant. (Trust me, without them, DALS would be all taco Tuesdays and cookie-cutter sandwiches.) 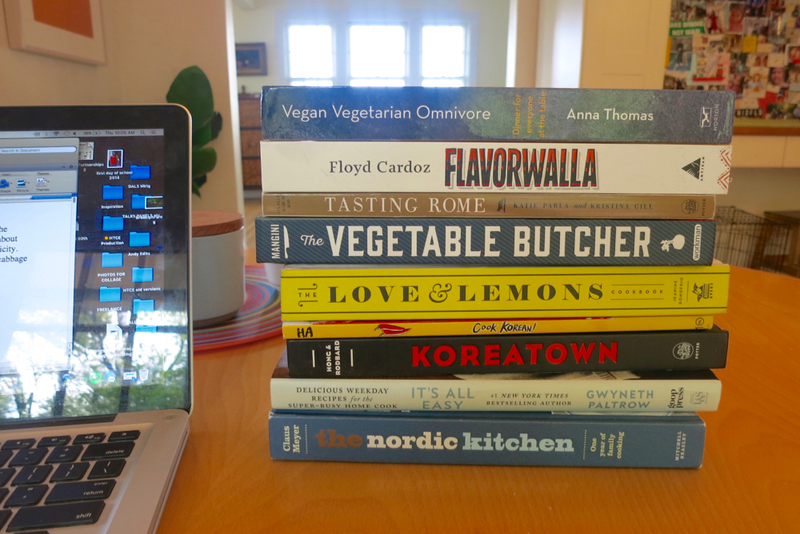 Anyway, every now and then someone gives me what I think of as the world’s most plum assignment: To write about my favorite cookbooks of the season. This past week, I did just that for the New York Times’ Book Review so head on over there to see which ones made the cut. I seem to be slightly obsessed with classic, traditional, authentic Italian cooking. I have both Tasting Rome and My Kitchen in Rome. Tasting Rome seems to me to be more “this is how Romans cook and eat” while My Kitchen in Rome is more “this is how and what I cook in my kitchen in Rome.” Both are excellent, but my preference leans toward My Kitchen in Rome. It’s a good read as well as a good cookbook. I’ve read about half of these. Love & Lemons is amazing. It isn’t often you find yourself wanting to make the bulk of the recipes shown in a book. You will with this one. Thanks for sharing!! Great books! Thanks for the recommendations! My question is, do you have any recommendations for non-English cookbooks? I recently went to Germany and was struck yet again by how unsweet (yet still totally satisfying and comforting) European cakes and desserts were. Even something as universal as a cheese cake or chocolate cake is just *different*. I was (pleasantly) reminded yet again despite my jadedness that there are some things you cannot experience/obtain via The Internet–which is fascinating to me–but that’s a whole ‘nother comment. She’s converted recipes from German recipes for American audiences. I look forward to buying it.